Well, many of the mourning customs practiced in Great Britain were also practiced in America, and in no greater way than during the devastating period of 1861-1865. I found Gettysburg to be both charming and hauntingly beautiful. It occupies so large an area that it is nearly impossible to see it all. It is also the only place I have ever been where people routinely walk around in 19th century dress and no one even bats an eye at it. I really loved this town and can’t wait to return. Reader Raven Ackerman (left, pictured her with her co-worker, Ashley), coordinated my visit to Gettysburg. She works at nearby Regimental Quartermaster, a fascinating place that outfits Civil War reenactors. 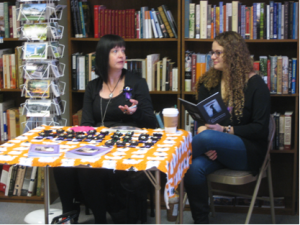 During the signing, Raven sold mourning ribbons that she had made. 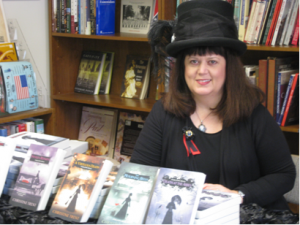 Yes, this is me in my new undertaker’s hat, purchased at the Gettysburg Emporium. Notice my jaunty ostrich feather on the side! 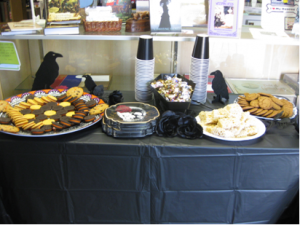 Raven provided an array of treats and decorated the bookstore with, well, ravens. 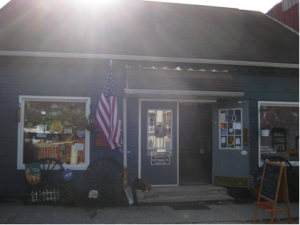 The exterior of Gettysburg Battlefield Books. 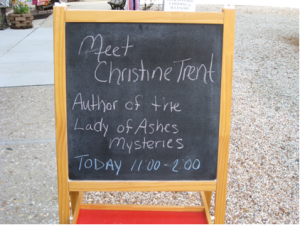 I sure did appreciate this thoughtful sign announcing my arrival.